In a previous post, I analyzed some interesting data coming from the Canadian Forest Pest Management Forum. I could find at least 119 species within 20 families of caterpillars (Lepidoptera) that have been mentioned as pests of some kind to our forests in the past few years. As a taxonomist working with braconid wasps, my next logical step was then to see how many parasitoid species have been recorded out of those 119 lepidopterans. For such a compilation I used the great resource that is Taxapad. 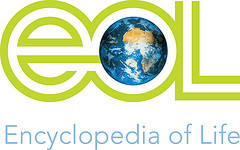 [I have mentioned previously what Taxapad is, and promise that will dedicate a future post to that magnificent database maintained by Dicky Yu (Canada), Cornelis van Achterberg (The Netherlands) and Klaus Horstmann (Germany). Suffice to say for now that Taxapad should be considered as a key tool by many biologists and entomologists, especially those working in biocontrol]. Altogether, 299 species of Braconidae have been found, worldwide, attacking those pest caterpillars. I stress here the world "worldwide" in the sense that those records go beyond Canada to include ANY braconid wasp that has been cited in the scientific literature as a parasitoid of those lepidopterans. It is difficult and very time consuming to separate the sources of information for each individual species and pinpoint the country source. And it is even more difficult to be sure about the certainty of some of those records -some are likely to be wrong for a number of causes. Still, they give us a kind of ballpark estimate about the diversity of parasitoids of forest pest caterpillars. So, for the purpose of this post we can take the worldwide totals as a first approximation to the story of what is going on in Canada. The first thing that becomes clear is how few we know about the parasitoid of those forest pests. Surely that 299 braconids sounds like an awfully large number of wasps, but the numbers are misleading (see the graph below). Because for 40 (33.6%) of those caterpillar species there is ZERO braconid wasps recorded as parasitoids. That means one third of the caterpillars where we know NOTHING of its parasitoid biology. For another 31 species of lepidopterans (26%) we only know one or two species of braconid parasitoids. Braconidae species (299) recorded as parasitoids of 119 pests caterpillars of some relevance to Canadian forests. Data source mostly from Taxapad (2012). 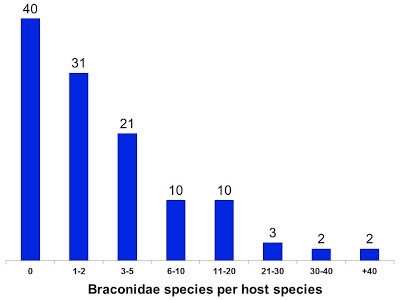 The numbers on top of each bar represent the actual number of braconids in each category. On the other side of the spectrum, we have recorded 30 or more braconid parasitoids for 4 species of caterpillars. They represent important pests (such as the spruce budworm or the gipsy moth) which at some point have been the focus of serious rearing efforts from biocontrol workers, resulting in hundreds of research papers. If anything, that should be the example to follow with other pest species that are important as well. Out of the 299 braconids, 120 species (or 40.1 %) were microgastrine wasps, reinforcing their importance as the main group of braconid parasitoids -not only in forestry but also in agriculture. Among other reasons, that is why this blog focuses mostly on Microgastrinae.